Feeding the Mind and the Body. SMP works to develop innovative approaches to eliminate barriers for children, implement community-wide solutions to hunger, and obtain key data to drive decision making. • Do you provide summer programming for youth ages 18 and younger? • Would you like to learn how to receive free nutritious meals for the youth in your program? Click the link below to view the event flyer. Please note that all of the food provided is at no charge to organizations serving meals or for the students who arrive for meals. All summer meal and programming sites will be listed on the Parent Calendar on this website. Please check the calendar for the latest daily updates. For more information about Summer Meal Partners, please contact Wendi Huntley at Connecting Kids to Meals. Please click on the icon located at the top-right corner of the map to enlarge and enter your address to find a Summer Food Service Program near you. Hungry? Many needy kids are hungry in the Toledo area. Thread Marketing Group and our own Whitney Rofkar worked hard to highlight the amazing new community kitchen of Connecting Kids to Meals. 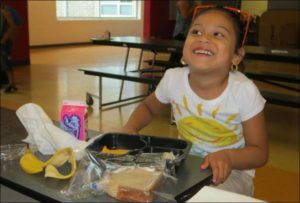 The Summer Food Service Program was established by the U.S. Department of Agriculture to fill the gap during out of school time when children who especially rely on breakfast and lunch being provided at school will still receive nutritious meals. There are 50,000 children in Lucas County eligible for free and reduced-price school meals. Of these children, more than half are estimated to be living in food insecure households where consistent access to adequate food is limited by lack of money and other resources. During the summer months, children are 2 to 3 times more likely to gain weight. Over 80% of the students in the Toledo Public School District qualify for free or reduced meals. In Toledo, 24% of the population lives in poverty. Lack of proper nutrition can result in increased health, mental and behavioral problems. Poor nutritional intake affects a child’s learning potential. THANK YOU TO OUR SUMMER MEAL PARTNERS FUNDERS ! Download the ODE Mobile App to Find a Location.